Unfortunately the harpist for tomorrow's performance of A Ceremony of Carols has been working away and is unable to get back to Wells because of the weather. It is with regret therefore that the concert has had to be postponed. The choristers have worked very hard on this wonderful work over the past few weeks and so we will announce a new date for their performance as soon as we can and hope you will forgive us if it is somewhat out of season! 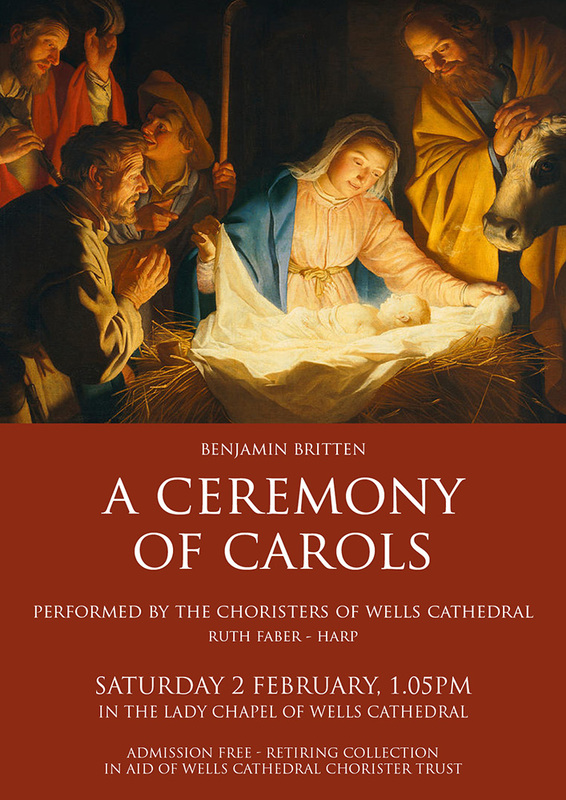 On Saturday 2 February, the Feast of Candlemas, the choristers will be performing Benjamin Britten's magical A Ceremony of Carols at a FREE lunchtime concert at 1.05pm. The performance will take place in the beautiful candlelit space of the Lady Chapel in Wells Cathedral and there will be a retiring collection in aid of the Chorister Trust. British composer Benjamin Britten wrote his cantata, A Ceremony of Carols, during World War II while he was crossing the Atlantic in 1942 aboard a cargo ship. Since then, the choral work has become a staple for choristers across the land during the Christmas season. The cantata is made up of 11 movements: 10 with voice and one for solo harp. It was written originally for a three-part boys’ choir, with soloist and harp accompaniment. Some of the carols are in Latin; some are in Middle English based on poems from the 15th and 16th centuries. As the threat of World War II loomed, Britten decided to leave England in 1939 with his personal and professional partner, tenor Peter Pears. They spent time in Canada and the United States before returning to England in 1942. While in the U.S., Britten composed several major works. His decision to go back home was prompted after reading a collection of poems by George Crabbe called The Borough. Published in 1810, this collection was set on the Suffolk coast where Britten was from. Britten and Pears boarded the Swedish cargo ship Axel Johnson in March 1942 to return to England. The voyage was dangerous with Nazi submarines inhabiting the Atlantic but the composer completed two choral works during the crossing: Hymn to St. Cecilia and A Ceremony of Carols.